A member of the family Ascaphidae (“tailed frogs”), represented by only two species, Coastal and Rocky Mountain Tailed Frog, both found only in western North America. Tailed Frog do not have an actual tail, rather males possess a fleshy appendage that is an extension of the cloaca. Snout to vent length: 2.2-5.1 cm (females larger). Adult and juveniles are variable in colour, ranging from light brown, tan, grey-green to charcoal. Lighter coloured individuals may have irregular dark spots on back. The skin is covered with minute bumps giving the frog a ‘pebbly’ appearance. A light-coloured bar or triangle between the eyes and snout is common, a dark broken line extends from the tip of the snout along the eye to the end of the head. The head does not exhibit a tympanum (ear) and the pupil is vertical. Outermost toes on the hind feet are flattened and wide. This species does not have an ability to vocalize like other frog species. Tadpoles range from brownish-grey to reddish-brown or black and are up to 3 cm long prior to metamorphosis. In some populations (e.g. US), the tail has a white tip. The tail is laterally compressed to provide streamlining in fast flows. Tailed Frog tadpoles have suction like mouth parts with rows of teeth on the top and bottom, allowing them to anchor to rocks (and other surfaces) in fast flowing water. The “tail” appendage is an adaptation to reproduction in fast flowing water, directing sperm into the female and reducing sperm loss during breeding. Coastal Tailed Frog share habitat preferences and some basic morphological traits with other frog species including Northern Red-legged Frog and Western Toad. Western Toad tadpoles, typically found in shallow wetlands or vernal pool habitats, have been known to occur in fast flowing systems where they could be confused with Tailed Frog tadpoles. Northern Red-legged Frog can be highly mobile in riparian areas where adult and juvenile Tailed Frog may also occur. The somewhat ‘pebbly’ skin of Tailed Frog could also cause it to be confused with juvenile Western Toad. Found in and around cold, clear (unsilted), fast-moving stream (<10 m) associated to old growth and mature coniferous, deciduous and mixed forest. Tadpoles and young-of-the-year (metamorphs) can also be abundant in streams flowing through clear-cuts, which is not necessarily indicative of long-term, sustainable populations. Associated with steep gradient, non-fish bearing waters, this species also utilizes systems supporting fish species such as Bulltrout, Dolly Varden, Coastal Cutthroat, Steelhead and Rainbow Trout. Frogs overwinter in ice-free areas under stream substrates. Tadpoles have been found in ephemeral stream systems, reappearing when flows return, possibly seeking refuge under wetted substrate. This species relies on heavily vascularised skin for much of its respiration and is especially prone to desiccation. Increase in water temperature can be lethal to Tailed Frog (>22°C). Adults rarely travel far from stream banks but have been found under logs and other suitable cover in forests adjacent to streams up to 40 meters. They will travel further distances from waterbodies if suitable cool, moist micro-climates exist. Tadpoles appear to move the greatest distance downstream, ranging up to 100 m from natal streams. They prefer smooth rounded substrate 5 cm and larger, not likely to fracture into angular pieces. Interstitial spaces (voids) between these larger materials provide refuge sites from flood events, bedload movement, predation, and warm temperatures. Typically these populations are found in systems where surrounding forest structure and understory diversity, flow regimes and water quality are not significantly impacted by clearing or stormwater runoff. Foraging by adults and juveniles occurs primarily at night, close to water (occasionally underwater), and targets a variety of preys including spiders, ticks, mites, snails, and various insects. Unlike most frogs, the tongue of Tailed Frog is not attached at the front of the mouth and they lack the ability to flip it out to catch prey. They must grab preys directly. Tadpoles attach to rocks in fast-flowing streams with suction–like mouth disk and scrape algae off the rocks with their rows of small teeth. The longest lived of the Anurids, Tailed Frog can live 15–20 years, and have the longest larval period (2-4 years) and longest time to sexual maturity (8-9)years), of all North American frogs. Tailed Frog are also the only North American frog to fertilize eggs internally. Sperm stays viable in the female’s oviducts until egg laying in June or early July. Each female produces a double strand of 44–85 colourless, pea-sized eggs that she attaches to the underside of a large rock or bolder in the stream in late summer. Embryos emerge approximately 6 weeks after egg deposition, feeding on a yolk sac which sustains them through the winter in the natal pool until their “suctorial” mouth is fully developed,after which they become more mobile. Habitat loss and alteration (large-scale or persistent channel disturbance) due to urbanisation. Distribution (i.e. Areas of the South Coast) coincides with areas undergoing rapid development. Alteration of microclimate regimes in riparian and upland forest areas, increase of water temperatures and siltation rates in streams, and habitat fragmentation due to forestry and other resource extractive activities. Changes in effect flow regimes as well as increase barriers to movement by adults and tadpoles dues to inadequately designed or perched stream crossings (e.g. culverts). Alteration of flow regimes or channel structure and seasonal wetted areas due to hydroelectric projects. Effects of climate change and natural events (e.g., mudslides/avalanches, storms, flooding) that increase siltation, water temperatures or levels. Direct mortality or sub-lethal impacts throughout all life history phases from fertilizer and pesticide applications in urban and agricultural areas as well as for silviculture management. Combined with a low dispersal rate, slow development, and low reproductive capacity, the species is highly vulnerable to local extirpation where its habitat is being encroached by human activities. 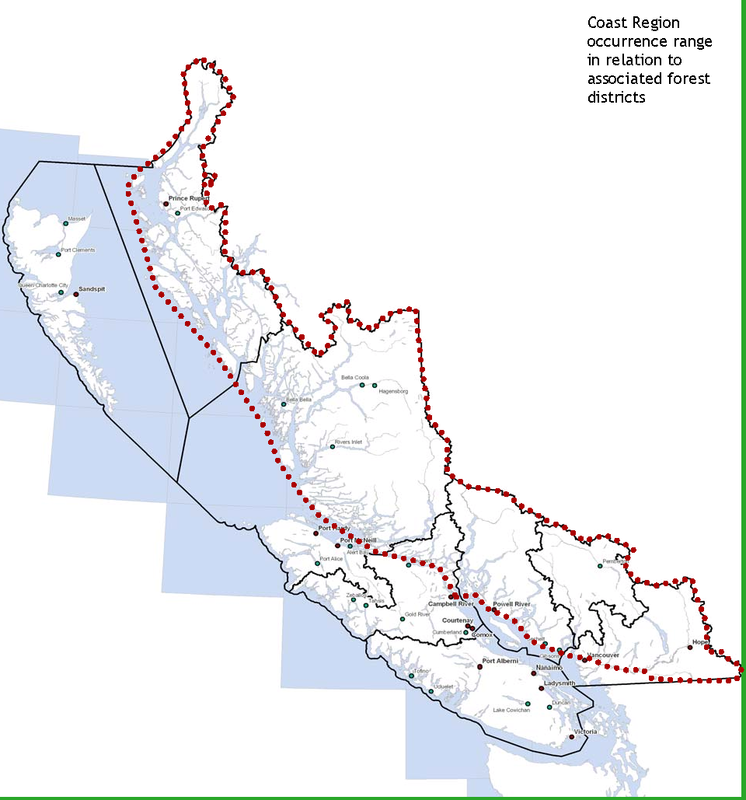 Please consult the “Accounts and Measures for Managing Identified Wildlife – Accounts V.2 Coastal Tailed Frog Ascaphus truei.”, and “EBM Working Group Focal Species Project”, Watershed-level Protection and Management Measures for the Maintenance of Ascaphus Truei Populations in the Skeena Region and other management resources identified at the end of this factsheet. Inventory and monitoring resources include standardized methods (Resource Information Standards Committee) # 39 “Inventory Methods for Tailed Frogs and Pacific Giant Salamanders (Version 2.0)2.” Other than areas supporting high density adult populations, typical visual encounter surveys (VES) for adults/sub-adults can produce inconclusive results. Larval surveys may provide greater certainty for inventory purposes. Other approaches to inventorying and monitoring such as those found in “Measuring and Monitoring Biological Diversity - Standard Methods for Amphibians” and “Suitability of Amphibians and Reptiles for Translocation” are recommended. B.C. Conservation Data Centre. [Internet] [Updated December 15 2010] Conservation Status Report: Ascaphus truei. Zevit, Pamela. 1997 and 2001. [Unpublished] Inventory of Pinnacle Creek and its tributaries in Southwest Coquitlam BC. Ministry of Environment Lands and Parks. Zevit, Pamela. 1995-1996. [Personal obs]. Ministry of Environment Lands and Parks inventory, Coquihalla, Big Silver and Chilliwack watersheds. Updated and revised by: Isabelle Houde, RPBio in consultation with the SCCP. Part of the National Conservation Plan, this project was undertaken with the financial support of the Government of Canada. Dans le cadre du Plan de Conservation National, ce projet a été réalisé avec l'appui financier du Gouvernement du Canada. Every effort has been made to ensure content accuracy. Comments or corrections should be directed to the South Coast Conservation Program: info@sccp.ca. Content updated March 2015. Image Credits: Pacific Tailed Frog: Garth Hodgson US Forest Service, Pacific Tailed Frog head close-up: Washington Department of Fish & Wildlife, Pacific Tailed Frog tadpole: Brian Klinkenberg, Western Toad juvenile: Walter Seigmund Wikipedia, Habitat: Pamela Zevit, Northern Red-legged Frog: Gord Gadsden. All other images have been contributed for use by the SCCP and its partners/funders only."